Eighteenth-century Polish physician, mathematician, and Talmudist; lived at Pinczow, government of Kielce, Russian Poland. 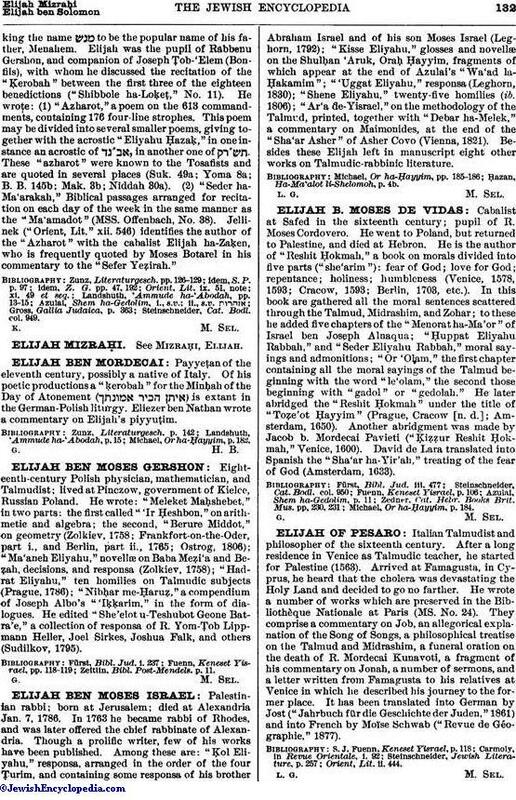 He wrote: "Meleket Maḥshebet," in two parts: the first called "'Ir Ḥeshbon," on arithmetic and algebra; the second, "Berure Middot," on geometry (Zolkiev, 1758; Frankfort-on-the-Oder, part i., and Berlin, part ii., 1765; Ostrog, 1806); "Ma'aneh Eliyahu," novellæ on Baba Meẓi'a and Beẓah, decisions, and responsa (Zolkiev, 1758); "Hadrat Eliyahu," ten homilies on Talmudic subjects (Prague, 1786); "Nibḥar me-Ḥaruẓ," a compendium of Joseph Albo's "Iḳḳarim," in the form of dialogues. He edited "She' elot u-Teshubot Geone Batra'e," a collection of responsa of R. Yom-ṭob Lippmann Heller, Joel Sirkes, Joshua Falk, and others (Sudilkov, 1795). Zeitlin, Bibl. Post-Mendels. p. 11.